2 season Kids Sleeping Bag with pillow in camouflage printed polycotton is warm enough for spring and summer camping as well as use at your home or caravan. Kids move about more in their sleep and the square shaped sleeping bag gives more wriggle room but 400g/m2 filling is enough to keep them warm. 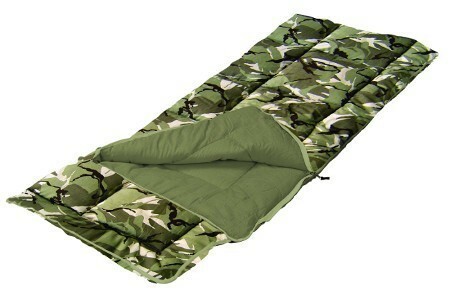 Polycotton lining has a more natural feel than fully synthetic 'bags and the Sunncamp Camo Junior can be opened as a double blanket or 2 bags zipped together to create a double.